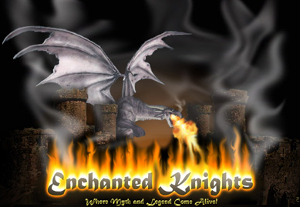 Located in the Mackinaw Crossings Mall in Mackinaw City, Michigan, we at Enchanted Knights invite you to visit our Realm! Our goal, in the Royal Store Rooms in Mackinaw and online, is to provide you with a truly unique shopping experience. Our store is staffed with a colorful cast of gypsies, pirates, maidens and elfish folk all eager to assist you, and well educated in all things myth and legend! Our items range from Medieval battle-ready weaponry to cold cast porcelain figures. With a fully stocked armory, and thousands of Renaissance themed items, you're guaranteed to find exactly what you or the fantasy enthusiast in your life is looking for. Come see our full sized knight, try on some period clothing, and sample a piece of Old World recipe fudge all in the heart of historic Mackinaw City! The Realm in Mackinaw is open daily May through October, and Saturdays in November and December, but the website is available for ordering or inquiries year round. Come visit us this summer, the Royal Court awaits your arrival!